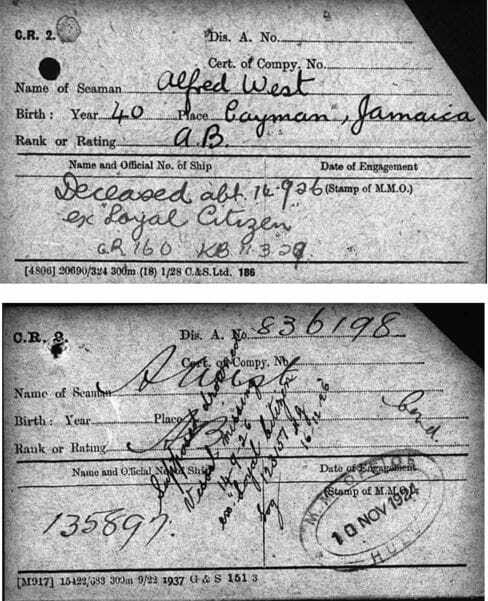 Alfred Leopold West was born in Rio Bueno, Jamaica on 8 October 1885. We know very little about his early life. 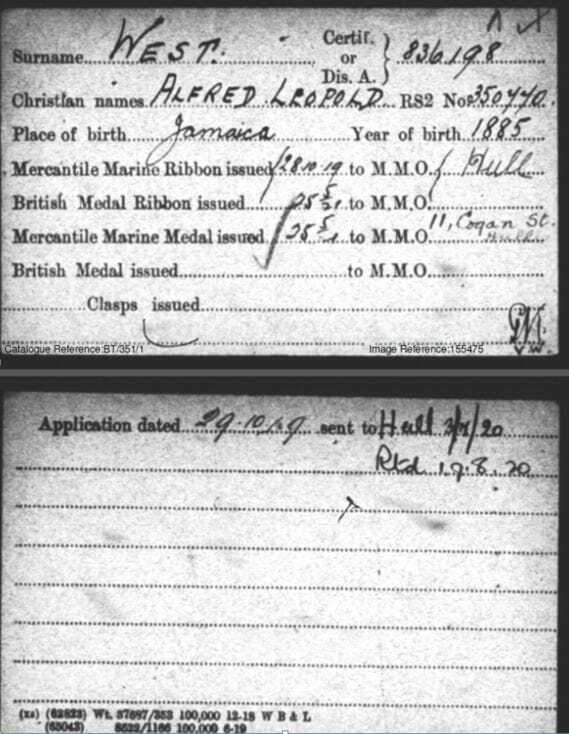 However, he joined Britain’s merchant marine during the First World War and after the conflict he was living in Hull. As demonstrated in his surviving seaman’s pocket, West was classed as an Able Seaman. Therefore, unlike the majority of Black sailors, West’s role was on deck with predominantly white sailors. He had extensive experience at sea and was well acquainted with his duties on board. This may have been a rank that he gained during the war. Before the war had ended in May 1918 West boarded the Indianola. Shortly after his return, West was employed on the Majorca in January 1919. However, no information has yet been found about these vessels. West gained employment on an unknown steam ship in July 1919 and the Visigoth in the December of the same year. The voyage of the latter lasted eighteenth months and if West remained on this ship for the entire voyage he would have visited Cardiff, Cork, Tenerife, Buenos Aries and Sierra Leone among other ports before returning to Hull. While on board the Visigoth, West had missed the violence that erupted during the race riots and did not witness the rise of unemployment during the early 1920s. However, unfortunately the lengthy voyage meant that West was unable to collect his war medals which were issued to the Merchant Marine Office located on Cogan Street, Hull on 28 October 1919. Thus, they were returned on 19 August 1920. No evidence has yet been found as to whether he ever received his well-deserved medals. Shortly after West’s return on the Visigoth, he boarded the Silarus which left Hull for Brazil on 17 August 1921. 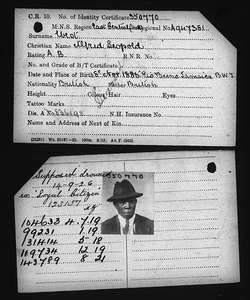 Unfortunately, very little information can be found about West between the end of 1921 and his death in 1926. On 14 September 1926 West drowned with the rest of the crew on board, the Loyal Citizen. 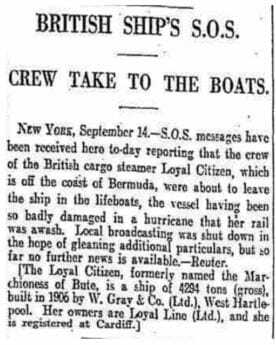 The vessel had sprung a leak in a storm off the island of Bermuda as it transported coal back to Britain. 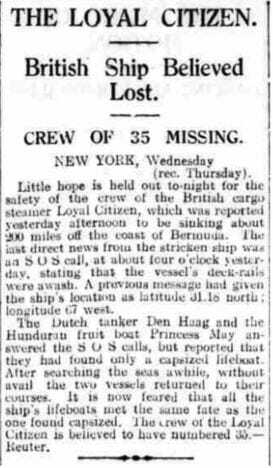 The newspaper reports document the distress calls and an attempt to save the crew. However, sadly when vessels arrived at the scene the ship had already sunk. Portsmouth Evening News, 16 September 1926.